Oh, what a month August was! The first half of the month found me planning a Farrar family reunion. For many of us, the reunion would be a time to remember our childhoods together. It was also the first time many of us cousins, descendants of the nine children of Raleigh Mae and Carroll Farrar, would meet. The weekend of August 14 – 16 we gathered at Red Top Mountain State Park on the shores of Lake Allatoona in Cartersville, Georgia. We rented cabins and a picnic pavilion and spent the weekend getting acquainted and reacquainted. We reminisced about stories of our parents growing up in the Kirkwood section of Atlanta. We guessed which aunt or uncle was the subject of family trivia questions. We ate an abundance of homemade goodies, but filled ourselves up more with family love than food. We hugged and laughed and cried a little at the end when the weekend was over. We also vowed not to wait fifty years for the next reunion. The reunion was also a time to share family pictures and this one was given to me by my cousin Phyllis, the baby in the photo. It was probably taken in 1941. The only Farrar child not in the picture was the oldest, Gerry. 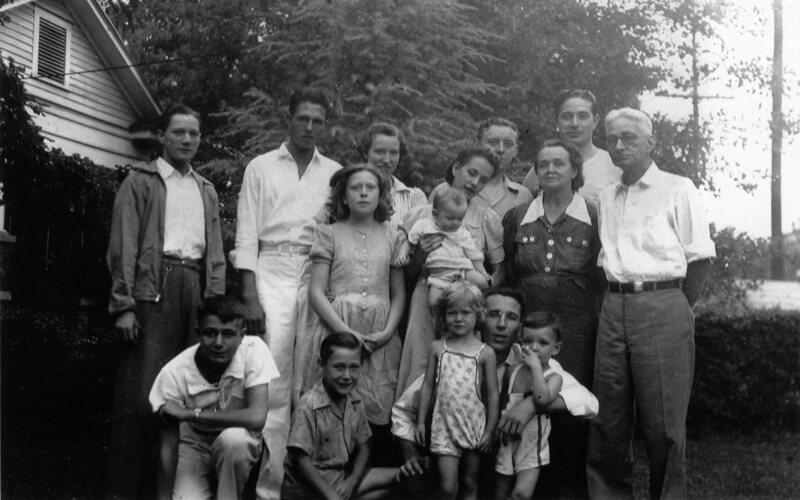 Standing back row, L to R: Ed, Bob Hunt (Janet’s husband), Janet, Unknown, Carroll, Jr. 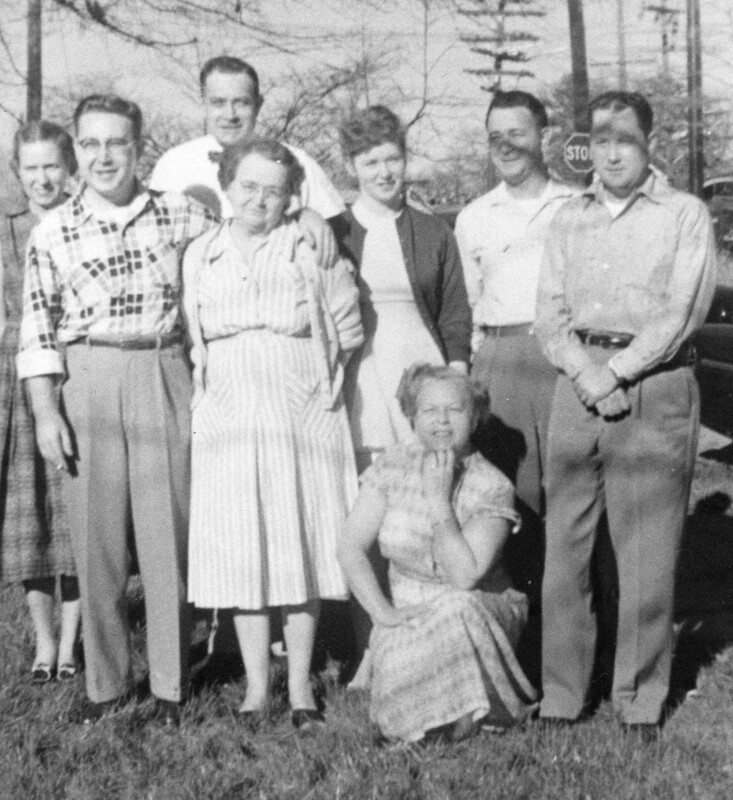 Standing middle row, L to R: Martha, Dot holding baby Phyllis, Raleigh, and Carroll, Sr.
Kneeling, L to R: Bob, Gene, Beverly, Hugh Cobb (Dot’s husband), and Denney Cobb. A later Farrar photo that still doesn’t picture all of the Farrar children together does include Gerry. After leaving Red Top Mountain State Park and my Farrar family, my trip back home to Atlanta continued for another week. Lunches and dinners with old friends and co-workers, Reunion Part 2 with my sister Nancy and cousin Terry in Terry’s cabin on the Tennessee River, and an important meeting rounded out the visit. The meeting? A piece of my father’s history turned into my reality when I met the widow and daughter of Bill Henson, the navigator who lost his life in the September 28, 1944 mid-air collision between Lazy Daisy and Lead Banana. My father was the waist gunner on Lead Banana that day and the only one of the crew who survived. I learned from Bill’s daughter that my dad visited with her mother after the war and kept in touch with her for some time. And incredibly, I learned that Henson’s widow’s family, the Whisnant family of Summerville, Georgia, lived next door to my grandfather Carroll’s brother, Baker William Farrar, and his family when she was growing up. 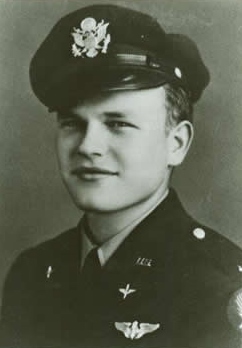 Even though Bill Henson’s daughter and I are not related by blood, we are related by our common histories and the brotherhood of the boys of the 384th Bomb Group of WWII. By thearrowheadclub in Farrar Family, Henson II, William A on September 2, 2015 .